The new suite at the Palms Casino Resort in Vegas will run you $100K a night. With a two-night minimum, at least to start. 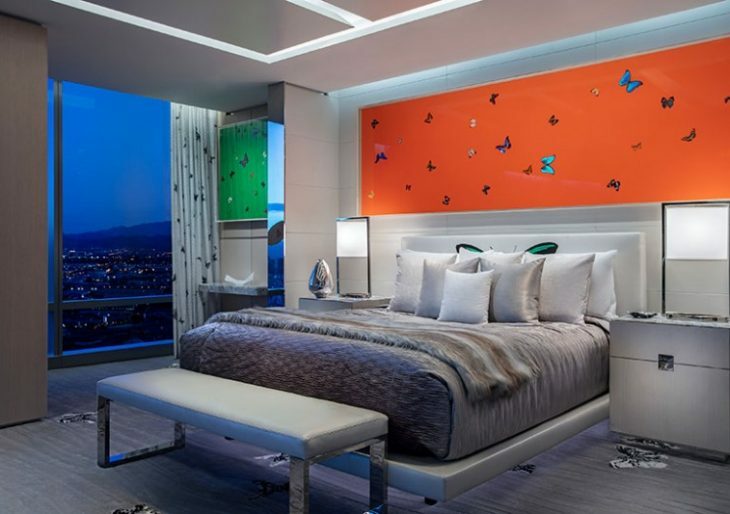 Located right off the strip, the glitzy hotel suite dubbed the Empathy Suite was designed by iconic British artist Damien Hirst. Guests will be surrounded by Hirst’s original work and distinct style in the luxurious two-story hotel room. At the intersection of glam and art is a party-worthy suite fit for 52 guests with an expansive lounge area and a large bar. After a long night out on the town, guests can relax in one of the two master suites furnished with California king beds. The suite boasts two massage rooms, a fitness room, a healing salt room, and an outdoor terrace looking over the city. Even better, visitors will have access to 24-hour butler service, chauffeured car service, and a private art tour of Hirst’s pieces. The Empathy Suite is just a small part of a much larger $690-million update for the Palms.